Cycling events on Teesside | theraceforthecafe.com . 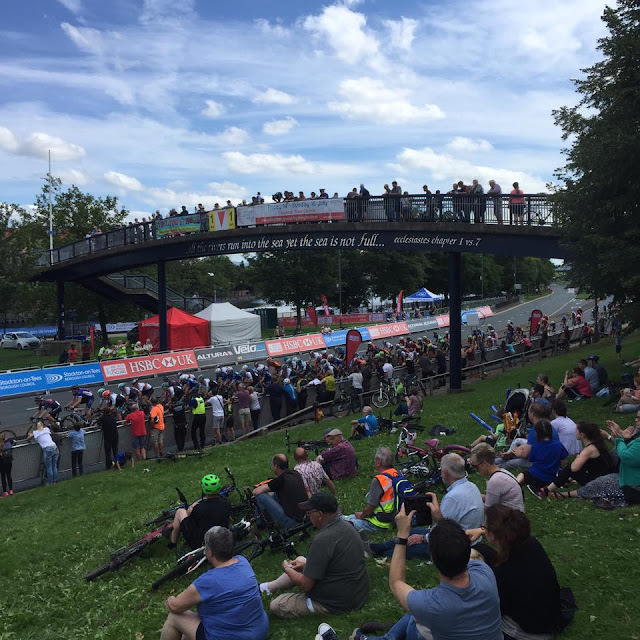 The riverside at Stockton on Tees is an ideal venue for the cycling festival and for the finish of the GP. The race is over 110 miles on a tough rolling course. Ten laps of the main circuit are followed by a further six laps of a short town centre loop. 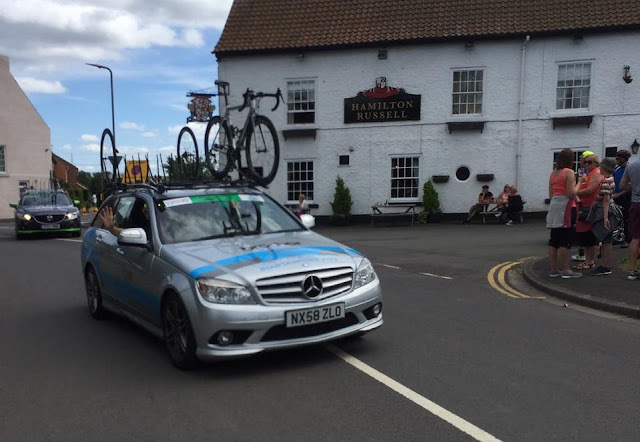 The Brother/NRG/DriverPlan team car in the convoy as the race passes through Thorpe Thewles. Above the early break of eleven riders goes through the feed zone at the village of Carlton on the main circuit. Most of the big teams were represented in the break so the bunch were content to hold the gap at around three minutes. As the race approached the finishing circuit the dominant JLT/Condor squad closed the gap down to a managable one minute. 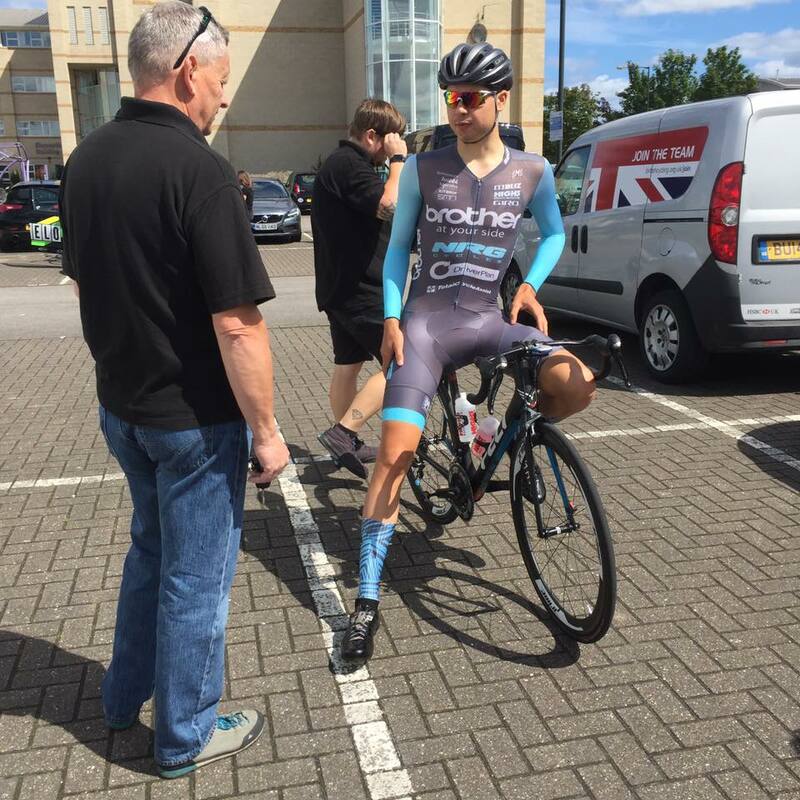 In a race like the Stockton GP the riders need to take on fluids and gels regularly. 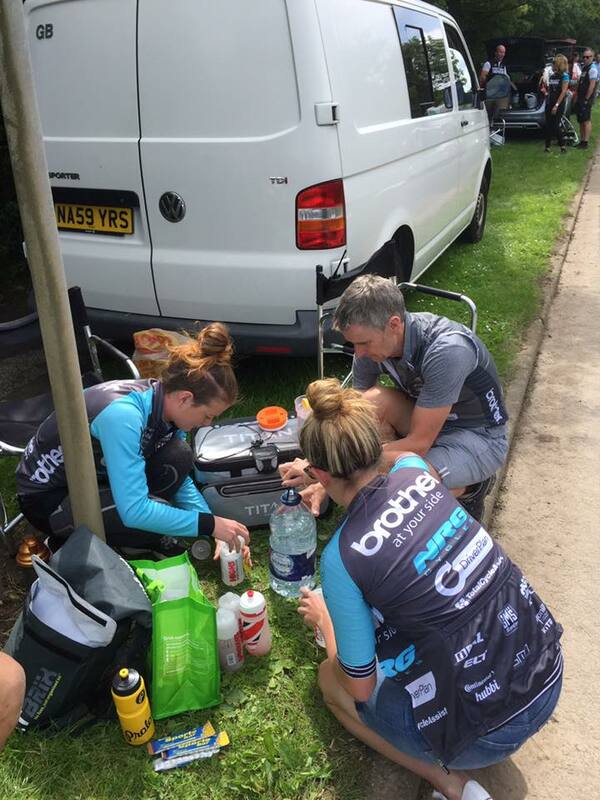 Above the Brother/NRG/DriverPlan support team prepare more bottles at the feed zone. The peloton on the riverside at Stockton for the final six laps of the short circuit. All of the BND team apart from Charlie were still in the bunch and looking to set our sprinter Jake Tipper up for the finale. Five times National Champion Dan Bigham makes a solo attack with two laps of the finishing circuit to go. 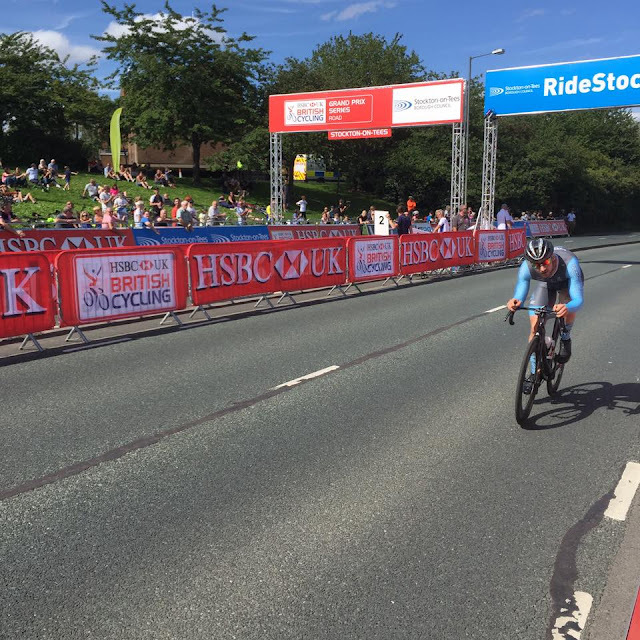 But with JLT firmly in control at the front of the peloton the gap was closed down and the race was decided in a bunch sprint. Jacob Tipper was the team's best placed rider but it was JLT's Brenton Jones who took the win in a tight finish. 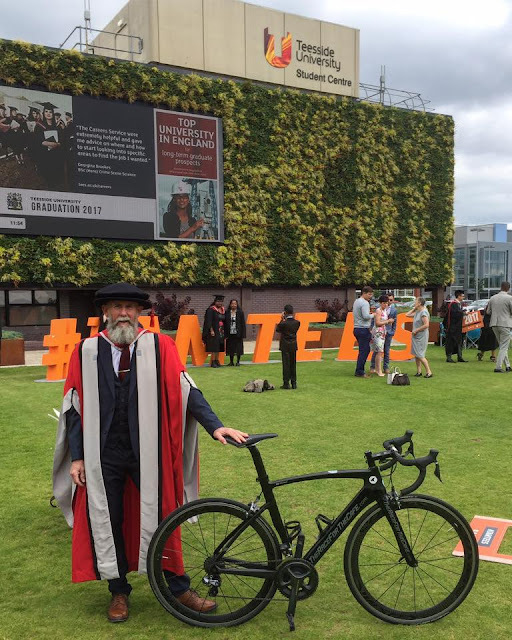 The second notable cycling event that I attended recently was my graduation ceremony at Teesside University. As regular blog readers will know I completed my cycling related PhD in January. After a succesful viva voce (oral defence) I had some minor corrections to complete, before being awarded my Doctorate in May. I have previously posted some research from my thesis here Strava and here Violence . 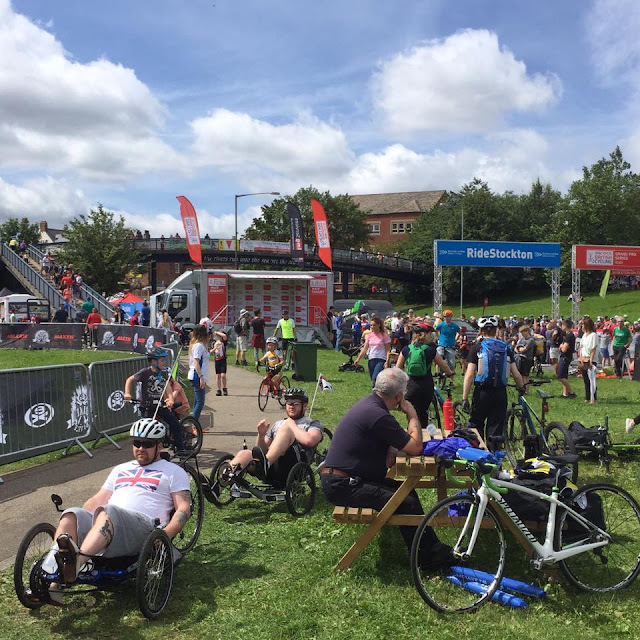 My thesis is a sociological examination of technology driven social change in cycling and is called 'The Race for the Cafe' which is where the blog name came from. It seemed appropriate then to be pictured with my theraceforthecafe.com branded bike at my graduation - I didn't take it in to the actual ceremony obviously, that would have been silly. 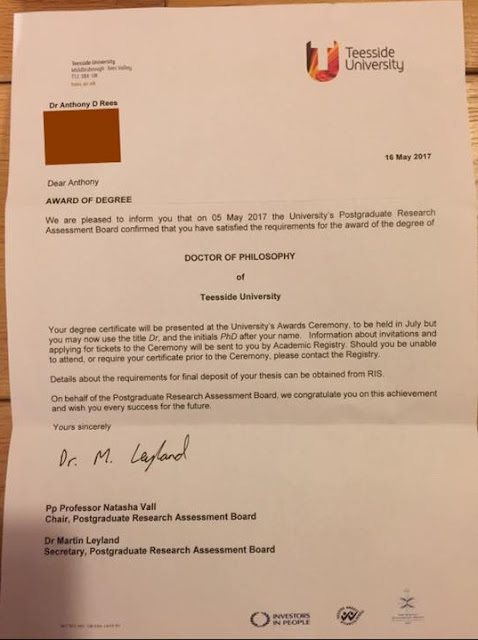 Above pictured with Mrs Rees, who knows how much my Doctorate means to me... and how hard I had to work to complete it, below, the acknowledgements page from my thesis. This thesis was made possible by the encouragement, support and friendship of many people. 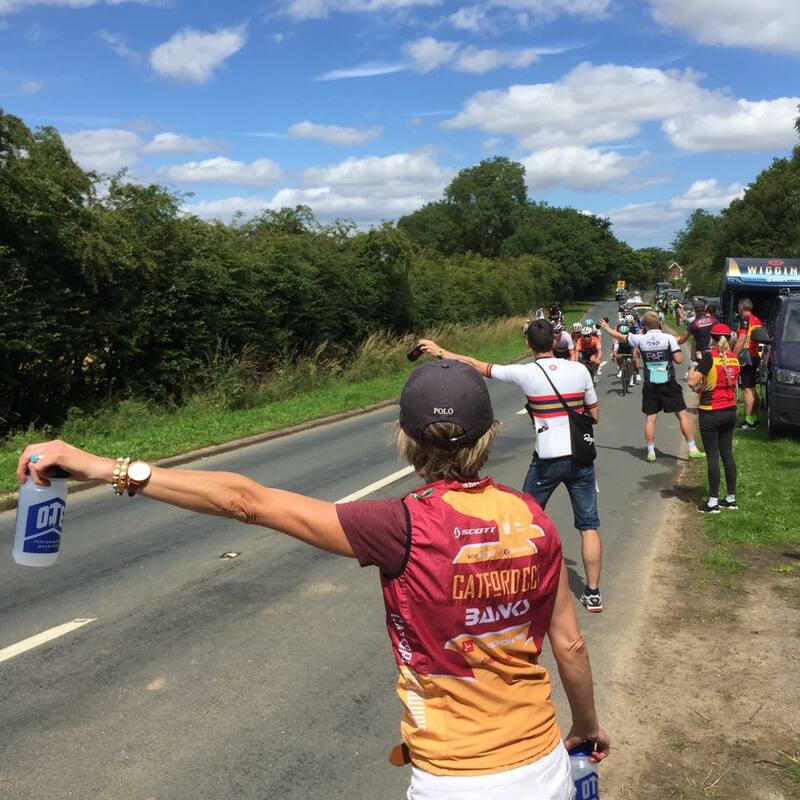 Firstly, I would like to thank all of the racing cyclists who contributed to my research, and whose input into this ethnography has been crucial. Their honesty and openness took this work in a direction which I had not envisaged at the start of my research journey. I am indebted to my supervisors, Dr Kevin Dixon, Dr Tom Gibbons and Dr Dave Morland whose suggestions, perceptive insights and attention to detail have been invaluable. Their confidence in me and enthusiasm for my project has been constant throughout. I would like to thank my children Jack and Ellie for their belief in me, and for helping me to maintain perspective on the important things in life. 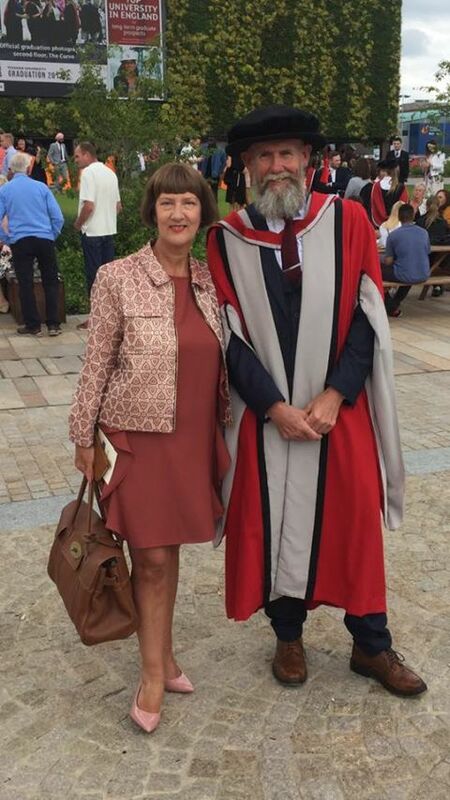 Biggest thanks must go to my wife Sue for her seemingly limitless tolerance of my academic and athletic endeavours, and without whose unwavering support this project would not have been possible. Completing my PhD was a test of endurance as much as anything else and was one of those challenges that became more and more difficult the closer I got to the finish line. In some respects it was a bit like completing an Ironman triathlon, my sport back in the day - see my posts here IM and here IM Lanza by the end you don't have much left to give. In my next blog I will be doing something a bit different and looking at the origins and history of Ironman triathlon (see what I did there?) Following that I will be posting a conversation with Ironman triathlete Craig Stevenson Ironman who (apart from being a really nice guy) just happens to be a sports physiologist, biomechanist and an expert coach - it should be an interesting read.